The time has come and I have the time. I am going to walk you through step by step how to achieve a similar flooring as what we’ve done. There is some important information that I will include here, so if you have questions about any of it, please feel free to contact me and inquire. Brown paper bags or a roll of brown paper, the kind you wrap mailer boxes in. Ram board, it’s a thin cardboard that construction/concrete workers use to lay out to keep floors clean during work. You’ll use it differently. antiquing paint for debossed image on floor, this is optional. image for your debossed area. polyurethane sealer, we didn’t even use a gallon. sealer applicators and applicator head. Time, the process is over the course of days, it’s not a slap it out voila you’re using it floor. Make sure you have time to allow things to dry. OK! So I encourage you to run tests prior to the project. I ran several with different glue down techniques, different staining techniques, I was looking for something very specific. All I learned from and found I needed a different direction. The thing about brown paper bag, is it will darken with moisture or oil, the sealer is an oil base, it’s going to darken that paper right up, which is fine, it was just to dark for my liking on this project. So after having stepped back a moment to take a mental inventory of what might work to “lighten” the paper. I came up with the color wash technique. We cut about 60 12 x 12 brown paper squares then crumpled the crap out of them, carefully opened them so they weren’t torn and proceeded to dip them in a watered down white house primer paint and water concoction. I can’t say specifically the dilution, this is why testing is important. This is all personal taste. Digressing, I separated the squares relatively evenly, I dipped the crumpled paper into the paint water, squeezed the excess off gently, opened flat and laid to dry. I dipped them all. Then went back after dry and re-dipped about 2/3 a second time in a more crumpled state then allowed to dry, went and dipped a third time on some of the squares and again dried. The ram board is what will go down first. Some of you may want to repair any big boo boo’s on the sub floor, we didn’t have many and what we had I was interested in keeping for a “stone” look after wards. I wanted a flowy bamboo infinity in the center of the main floor in the bathroom, it’s my spa room. My husband got a copy made big enough for me to use on a floor at the builders exchange locally. I glued the image to the ramboard, allowed to dry then box knife cut CAREFULLY, the image from the board, essentially making a stencil.We glued that down directly to the subfloor. Now is the fun part… the gluing can make or break the design, and I knew this going in so I will share with you some details that weren’t out there for me in other walk through sites… hence my own. So far I know this may be long winded, but I want you to know what I learned so you don’t waste time or products. First step, clear the floor. Solar powered Niches, they come on when the sun goes down. Start the gluing, I poured out the glue and used my spatula to spread out, I would strike the edge of the spatula on a bare space to clear the glue and then use the spatula to flatten the paper to the floor. There will be texture, you crumpled wet paper and dried it. Work with the texture and smooth out as much as your tastes prefer, then move on to the next tile. Here is a trick to the glue, where you strike your spatula on face of the tile and leave glue that spot will look different under the sealer. For instance on my floor I would purposely strike my spatula to “clean it” on a tile I glued down before, leaving a line or smear of glue, the glue provides a “seal” that the sealer goes over, the glued parts resembled a less traveled section of the floor, it aged it in other words. RUN tests and trial, that is the best advice I can give. Continue to glue the tiles down, when you get to the part where you’re gluing them to the cut out you created, use the foam paint brush and tap the paper down into the edges to create the debossed image. Continue the glue down until you’re done and allow it to dry. It doesn’t take as long as you think it will, but by this time it was evening and we were tired so we bedded down and started over in the morning. Yawn, stretch and paint the inside of your debossed image. We chose a brown to coordinate with our bathroom colors. Paint dries and then you start the sealer. Read the instructions and make sure you follow them. Spread the sealer out and allow to dry. Your floor will need 6 to 8 coats of sealer. We did ours on a weekend, we were able to coat in the morning, then again in the evening. We ran fans to assist in the fumes and drying. We’ve had our floor just coming up around a year and it’s still like we put it in there yesterday. I mop it like a normal floor and I am not afraid to spill on it. We shower, bath dogs, I do all my fiber washing and never have run into a water issue. So this is basically it. A lot of prep work as with any project. We love the results and have heard numerous times it looks like travertine tile. Check out the Share and Show! Visitor shared brown paper bag projects! Hi, I left a comment yesterday under “about me” because I didn’t see this one. What did you use between the cracks on the Ram board before you laid the “tile”. Thanks for the great tutorial. We used wall repair compound to fill between the ramboard. Thank you for the comments! Hi. I am doing 2 different paper bag floors. 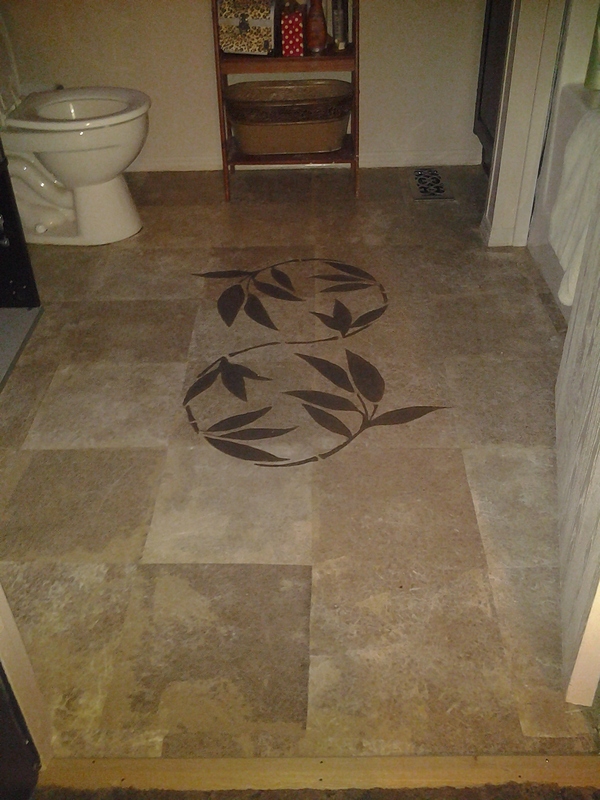 I have finished the ripped one in the master closet and I am at the trial stage in the tile floor for the master bathroom. As I am having trouble gluing the tiles to my trial board I realized that due to the paint whitewash they do not stick as well as the ripped leather look pieces in the closet. I think I have figured out why but want to check with you. Did you use your glue full strength or watered down. For the closet I did 50% watered down glue like most tutorials on paper bag floors suggest, it worked well. After rereading your instructions, I am thinking that you used full strength glue and lay them down dry rather than dipping them in a glue water mixture, is that right? Also, did you just clean your spatula on part of a tile or use it to spread the glue over the whole tile? I think reading tutorials from 2 different styles confused me. Anyway if this works, I will be so happy! Thanks for posting your tutorial. What you have accomplished is amazing, very unique among paper bag floors. I pre-color washed all tiles in my paint mix, I dried completely. I used full strength glue. The spatula smooths out some wrinkles of texture on the floor, if I got glue on my spatula, I would strike the flooring in various areas to clean it. Where the glue is on top, the sealer doesnt darken the paper. It left cool aging effects. Im excited to see your results, please share! I finished my floor and wanted to send you a picture but don’t know how on here. I am so happy to have found this post! I am determined to do this in my bath and am thrilled to see that you were able to lighten the paper! I’d like to know what poly product you used and how things are still holding up. Thanks for sharing this! Jane, we used varethane. (Sp) poly sealer. We chose a semi gloss finish. It’s still as nice as the day we put it in. No problems at all. If you go with the ramboard, we filled the splices when needed with wall putty, fyi. Please contact me when the floor is done, I’d love a picture! Did you ever try the flooring? I’m curious to know! Great Floor! I left a question on your pinterest page but in case you didn’t see it I was wondering, did you glue down the ram board or tack it? I glued the ram board down also. Thank you so much! Blair, I apologize, I don’t think I ever responded to this! Uhg, I will be better about checking and responding. We glued the ram board down with the elmers glue as well as the tiles. The only glue we used was elmers. It has awesome give, easy to work with and dries pretty quickly! Great bond over all. Thanks for the question. I bought rolled paper too for the consistancy. If the paper didn’t vein like you want, get creative with sponging or ragging those areas you don’t like with the same paint / water mix you used to dip and create your veins that way. If it’s a wall and depending on what you were looking for, there is some great patina finishes to add visual effects. Don’t freak out, think outside the box! The “veiny” look was something that was just in the paper. I used elmers glue and h20 with “all” the paper. No paint…I wanted the natural color…..I tried dipping a sponge in the glue/water mixture and all it did was absorb with a flat look…and thank you by the way for responding!!! Ohhh. Okay I dipped mine in paint and water and created the veins with paint. In terms of creating the veins with no paint and water… now try sponging on the straight glue, no water. I didnt have glue and water. So this route I can’t have an honest contibution of help. I can only make suggestion. I assume the veining you’re referring to is where the glue rested in the crumples and was thicker? If so, you may have to create your own veins with glue. Did you run any pre-project trials? I did two walls and for the most part they were all veiny albeit different shades, which was fine. I used a variety of trash bags that patients/friends brought me to do my walls. It wasn’t until the end of the second wall that almost all the paper was of a flat look. So, after trying all different bags I bought the brown paper hoping that at least the big wall would be one color and have veins. I planned on using this as the “main wall”…but…the roll did the same as the bags…some are flat looking and others are veiny with no rhyme or reason…I tried the straight glue..didn’t work. As far as any glue laying in the wrinkles, no, I squeeze the moisture out as much as possible (same as for other walls) so there are no pockets of glue….. I am emailing my #. Call me! My husband has the only phone and he’s not here! I am sending a pic..maybe it will help to see my dilemma.. I used 1 color watered down, if I wanted lighter I would redip. No, I allowed to dry then put the glue on the floor. I used the glue in part to create the aged look, the sealer sits different on the glue. Yes, however, you can use as many colors as you choose! I’ve done a 7 color floor! But yes, I watered down the paint and crinkle dipped paper. Squeezed out as much as possible and allowed to dry. When I wanted a “lighter” tile I’d re-dip and dry until I was happy. I’d love to see pictures when you complete! Okay Tina, this is Tina again. I completed my living room walls (woohoo!) and I used Min Wax Special Walnut that has the sealer in it. I purchased a satin poly to apply (which I haven’t done yet) The walls are kind of shiny from the Min Stain and Sealer. My question is, will the satin decrease the shiny? and I assumed I needed to use a poly on the wall for cleaning…..
LOL, okay, with my luck we know it WILL crackle!!! Is there a way to prevent that before it happens? I will send pics. I don’t have anything up on the walls because I wanted to get everything done and cured before I started putting pics and mirror up. I don’t know how to avoid it. It’s something to do with the way it cures. I don’t feel concerned personally. How long has the current treatment cured? Thanks so much for sharing your project with me! ❤ Tina R.
Tina, will you resent your email! 48 hours and I won’t be getting back to it for a week with the poly because I have my grandbaby one week on one week off and I don’t want you breathing it….I sent pics. Any suggestions? I emailed. Yes, wait on sealing. When you do seal make sure you have enough ventilation, the more you have the better and quicker you will cure out and the smell will dissipate. You did a fantastic job. When it’s sealed, send me a picture please… I’d love to post it on a page so others can see what others did ! Ofcourse, with your permission. You will add water until you’re happy with the color wash you’re getting. I spaced them when drying. Just enough not to lay on each other. Ok, I’m getting ready to start making a “mom room”. My oldest is gone 2/3 of every week for college where he stays at his apt, his younger brother immediately took over the bigger more private room. Now they seem to share it for the 3 days a wk my oldest is home. This has brought about a remodel idea of making the small room mine. The closet will be transformed into a craft dest/storage area/work space kind of thing. One half of the room will be a vanity with all my girl stuff, I had a stroke a yr and a half ago, and since then I’ve become partially paralyzed, meaning I can’t stand and balance long enough to be in the bathroom. Also with a wonky arm I need to get much closer to mirror and balance my arm. Then the other “half” I’m transforming into my snuggle/reading/alone time/vlog set type area. I’ve seriously gotten so far off track! Ugh, sorry! So, I’m doing a paper floor, and I’m wondering if you think it’s possible to do the same as you did, but with a patterned scrapbook paper? Or possibly paper photo backdrop paper rolls? Only because then I could truly have the old barn whitewashed wooden flooring I’d really love to have. I’ve found it in both, paper square type and rolls. Rolls are obviously cheaper, and is feel like would look more natural as the pattern would be larger and not then repeated ever 12 inches, since I want it to be wooden. But your the first I’ve seen that didn’t do a over paper glueing method, or an overlapping paper method. Did you not get shrinkage as it dried because you didn’t over top glue, except to make your wear patterns of course? I’ve been searching for someone who’s used the method I’m thinking of, and I’m sure there’s someone, but my stroked out brain either can’t find it or is skipping it. I’ve searched for weeks and you have come the closest to I think what I need to do. Any advice will be helpful. As I want to well inform myself before I buy and need to return, as shopping is not longer a fun or easy task. But I will literally do anything to make this room happen. My own sanctuary? Crafting in peace? Doing my hair without being in the dining room? And having a beautiful vlog set is just almost too much for me to actually think about! Lol! When the youngest leaves in 4 yrs, he can have the big room as his, this one is mine! Hubby wants a man room/theater, I’m down for it, but not until I have a place to do the things I still can without being in the kitchen/dining room! I’ll share, he can come in whenever he likes, but somehow I can see my big burly football coach enjoying my Parisian love letter themed room! But he’d look so cute on my beautiful vintage white fainting lounge! Lol! Sorry, I’m a rambler. Shutting up now! You’re cute! I did have about 1/4 overlap for shrinkage and stuff. Any paper will work. If it’s a patterned or colored paper remember that the sealer is going to change it’s color. Run some test boards of the paper you’re considering and see the end result! Test test test. May be lovely paper until the sealer goes on… then it’s to late. I would love to see pictures when done! Ugh! I hate testing! I know it’s the right thing to do, but I’m just so darn impatient! I want to do it all…..now. Yesterday. Last week! Lol! Ok, I will test. If this actually by some miracle works and I can use photo backdrop paper rolls, like wallpapering the floor in a sense but better of course, then is just can’t see why anyone would ever pay for proper flooring again! Well, maybe if you could afford it I suppose, but the look I want for less than $150? That’s like some miracle! The cost of what I really want was just stupid! Who knew people could get away with charging so much for actual old whitewashed floorboards? Well, if this works, not only will I send you some pickes, but I’ll send some to the loony people who wanted me to pay astronomical fees for OLD WOOD! I mean I could make new wood look old for cheaper, it would last longer as it’s new. But I really can’t do the work, I’m lucky if this room is done in a yr with how little I can seem to get done by myself these days. I’m a determined momma though! I’ll keep in touch letting you know how it goes! At this point, I think I’m just praying it’s not cement under the carpet! Lol! Just more work, work I must rely on hubby for! Fingers crossed and thank you for your thoughts, even if I didn’t like hearing them! I’m excited to see pictures! truly a fastidious piece of writing, keep it up. community. Your website offered uss with valuable indormation to work on. You’ve don an impressive process aand our entire neighborhood can be thankfull to you. Hello just wanted too give you a quick heads up. The text in your content seem to be running off the screen in Firefox. I have stacks of white paper bags….do you think those would work as well?? Instead of trying to lighten them? That’s a super good question! This may be lengthy but there is good reason. First, you can use any paper, truly. The issue is, how is it going to look under the oil based sealer? For instance, white paper turns translucent like a cooked onion when oil gets on it. So you have to take into consideration what the sub-surface looks like under the white. I cannot express to many times that running swatches before hand you will know more what to expect before jumping in and possibly end up hating the outcome, run swatches on small sections of a board to see what the different processes look like so you have the end result correct for you. But ANY paper can be used. No, you dont have too. I used mine really for the cut out feature! Send pictures when complete and it’ll go on share and show post! Please. And thanks so much! Btw, yes hubby and I have done the floors ourselves. Even a 1300 sq ft. Church floor! It’s really a great and useful piece of info. I’m happy that you simply shared this useful info with us. I did something similar in my son’s room, so I am familiar with the technique. I love the tile look and really want to do this in my bathroom. My problem is, we only have one bathroom. I know it’s a long process, so any suggestions on how to do this without interfering with the use of the bathroom? Plan a small road trip for overnight. Complete floor, leave to dry and air out. Celebrate with a fun evening away. Come back to useable floor!